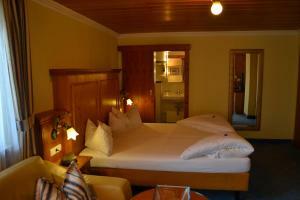 A-HOTEL.com - Luxury and cheap accommodation in Ramsau, Germany. Prices and hotel, apartment booking in Ramsau and surrounding. This indicative offer was derived from the most recently booked accommodation in Ramsau and sort by the price, from cheapest Ramsau accommodation to the most expensive hotels. To select accommodation by your preferences we recommend to choose from 43 accommodation offers in Ramsau in total. By entering the dates of your overnight stay in Ramsau and using the filter tools you can sort the best possible accommodation for you. The entered dates of your stay are crucial for the most accurate offer as it derives all the online information on pricing and availability of Ramsau accommodation. Then you can book the selected Ramsau lodging (hotels, apartments etc.) immediately. Located directly on Lake Hintersee in the Bavarian Alps, this family-run guest house offers great mountain views, a restaurant with lakeside terrace, and country-style rooms with free Wi-Fi. Bavarian specialities and a daily breakfast buffet are served in Gasthaus-Pension Seeklause’s rustic restaurant. This hotel features free Wi-Fi in public areas and a free sauna. Surrounded by the scenic Zauberwald Forest, it offers country-style rooms with satellite TV. Offering scenic views of the surrounding mountains and 3 km from the Austrian border, Haus Almfrieden is situated in Ramsau. Free WiFi access is available and Königsee Lake is only a 20-minute drive away. This family-run guest house in Berchtesgaden is located beside a forest, 800 metres from the centre of Ramsau. It offers quiet rooms and a daily breakfast buffet. Boasting a traditional Bavarian design, this guest house in the climatic health resort of Ramsau is ideal for exploring the hiking routes and ski runs of the Berchtesgaden National Park. Just a 10-minute drive from Berchtesgaden and the scenic Königssee lake, the privately run Alpenresi offers peaceful rooms with en-suite facilities. Featuring a garden, terrace and free WiFi, Gasthof Oberwirt is set in Ramsau, 7 km from Schmuckenlift. Boasting an ATM, this property also provides guests with a restaurant. Set within Berchtesgaden National Park, at the foot of Watzmann Mountain, Berghotel Rehlegg offers traditional Bavarian accommodation. It provides panoramic spa facilities and hiking possibilities among breathtaking scenery. Pension Bergbach is located in the National Park Berchtesgadener Land in Ramsau, where the UNESCO protected Waterfall Wimbachklamm is 5 minutes walk. The famous Parish Church of St.
Set 7 km from Schmuckenlift, Haus Malerwinkl offers a garden, a terrace and free WiFi. Each unit has a toaster, fridge, a coffee machine, as well as a stovetop and kettle. This family-friendly guest house is situated in a sunny part of Ramsau, only 200 metres from the renowned Soleleitungsweg hiking route. The Gasthof Baltram is a cosy base from which to explore the Lattengebirge mountain range, Mordaualm pasture and lake Hintersee. Offering a terrace and views of the mountains, Homestay Sieger-Brandner is situated in Ramsau, 25 km from Salzburg. You will find a shared kitchen at the property. Offering a garden, Ferienwohnungen Haus Hirschpoint offers accommodation in Ramsau. Salzburg is 24 km away. At the foot of Watzmann Mountain, this hotel features a large garden with farm animals. It lies in the Berchtesgaden National Park, 5 km from Ramsau and 10 km from Lake Königsee. This accommodation is peacefully located in Ramsau, beside the beautiful Berchtesgaden National Park. It offers rooms with balconies, a sunny breakfast terrace and a large garden with playing field. Located 24 km from Salzburg and 32 km from Saalbach, Ferienwohnung Am Forstamt offers accommodation in Ramsau. There is a seating area and a kitchen as well as a private bathroom. Located in Ramsau, 6 km from Schmuckenlift and 6 km from Hochschwarzeck, Haus am Reschenberg offers accommodation with free WiFi and access to a garden. All units come with a seating area, a sofa, a flat-screen TV and a fully equipped kitchenette. Gästehaus Heißenlehen is situated in Ramsau, an elevated valley at 900 metres with a view of Watzmann Mountain. The guest house offers a terrace and scenic views over the Berchtesgaden National Park. Haus Kehlstein is set in Ramsau, 24 km from Salzburg and 7 km from Berchtesgaden. The property is peacefully located in the National Park Berchtesgardener Land in Ramsau, next to the UNESCO-protected waterfall, Wimbachklamm. This Alpine-style guest house in Ramsau is located in the beautiful National Park Berchtesgaden. Guests can enjoy stunning view of the mountains from the balcony of the apartments on-site. Quietly located in the Berchtesgaden National Park, this family-run, 4-star hotel in Ramsau offers brand new, alpine-style rooms and serves traditional Bavarian food. Guests will enjoy the modern sauna, heated outdoor pool and spa facilities.